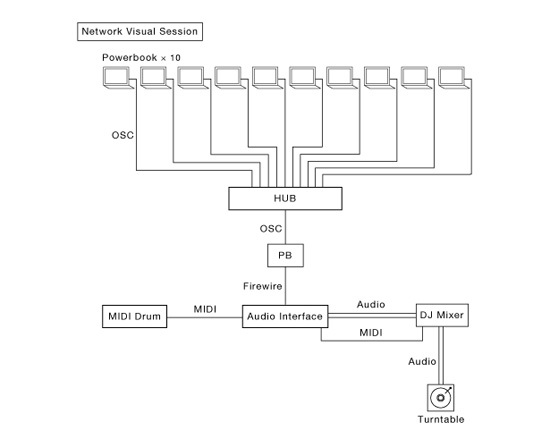 This is a video session through laptops connected to each other with a network. 10 laptops for visuals, 10 projectors, 2 laptops for audios, and MIDI drums are used in the performance. The participants in the workshop held in Aoyama Office were the main players, and Mr. Vokoi from the VJ unit, Tripron, and Mr. TCY joined them. This project was designed, directed, programmed mainly by Daito Manabe. The image created in the first laptop is sent to the second laptop through TCP/IP. The second laptop gives the image effects and sends the resulting image to the third laptop through TCP/IP. The same process is repeated in each laptop, and the last laptop projects the image. Sometimes, the last laptop sends the resulting image to the first laptop again to make feedbacks. This project makes the best use of 10 laptops and their network, and presents a new possibility of the visual arts.